Last night M made a large batch of fried rice, enough to feed fifteen people. This morning I made a pan full of apple cake. Around noon we walked down our block to deliver this food to our Schülerladen, where E and a dozen other children and a few adults are now enjoying their school lunch, homemade by parents. As they do every day. Schülerladen still boggles my mind. It is unique to Berlin, I’m told. A German friend visiting from Bavaria, a teacher in training, said she’d never heard of the model. And Berliners have told me it can only be found here. So I think it’s worth taking a few minutes to describe it. E attends the local Montessori school across the street from us. There are no school buses that bring kids here, and actually, now that I think about it, I can’t say I’ve ever seen a school bus in Berlin. I think they exist for magnet schools like our American school, but they are not the ubiquitous sight they are back home. The kids walk, bike or take public transportation to their neighborhood school, and some parents drop them off, though there is no parking lot for the school, just two dead-end streets with a turn-around, and trust me when I say it would be utter mayhem if more than a handful of parents drove their kids to school. The school day for the young students lasts until 1:30 p.m., after which students must move to their afternoon activities: they either attend Freizeit, which is the free program offered at the school itself, or they walk to a Schülerladen of their choice, an after-school program which is run outside of, yet in tandem with, the public school system. A family that lives above us urged us, upon arrival, to consider Schülerladen. I think it’s fair to say they encouraged, cajoled, and even pressed us to join this Schülerladen, though we couldn’t quite tell at first why we should pay the 75 Euros a month (averaging about $6 a day) when the school offered something similar for free. Schülerladen sounded more complicated, given that it is a system that operates outside the school. But with our neighbor paving the way to enrolling us, it could not have been simpler, and we have no regrets; we even sometimes say that Schülerladen is the best thing we’re doing this year. 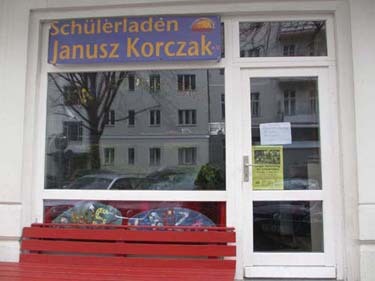 Schülerladen means “student store.” There are about 250 of them in Berlin, accommodating about 4,500 children, according to an official website about the network of centers. They are state supported, so parents only pay about 10 percent of the actual cost of attendance, making it quite a bargain. These day cares, of sorts, are located in storefronts with glass windows facing the sidewalks; they are sandwiched between apartment buildings, as in our case, and sometimes in between small businesses like cafés and retail shops. These are, in effect, prime retail spaces set aside for children. Our Schüli (the nickname for Schülerläden) has four rooms. It feels like a child’s wonderland. The entry room has an aquarium, a couch, space to store backpacks and boots, and a table the size of a homey kitchen nook where there are often card games, board games, or art projects underway. The next room is filled with a wall of toys and games, a mountain of Legos, and a handmade loft climbing structure with ropes and ladders and pillows. Behind this is a small dining room where the kids and the grownups eat lunch together—homemade meals brought by different families each day. Each family provides a meal once a month. Beyond that are the kitchen and the bathroom, plus a closet full of wood scraps from past and future woodworking projects. In the hallway is a secret passageway to access the loft; someone put up a ladder and cut a hole in the wall to make the loft even more fun. The whole place has the feel of a student’s apartment, where there’s nothing of real value, but it feels comfortable and casual, and it’s clear that no matter how rambunctious the kids get, they can’t do too much damage. There are two teachers who run the place. They are as laid back as you could imagine. They are so laid back, in fact, that one time I came to pick up E and I found one of the teachers asleep on the couch. Parents have keys to the place. It’s like a co-op and they are the owners, it seems. Our family isn’t engaged enough to understand the ins and outs of the place, but we’re getting the sense that it’s an old-fashioned model that may be on its way out because so many families have two wage earners, making parents less able to stay engaged in running the place. A friend who holds a corporate job and has a son in another Schüli once told me in exasperation, “They expect the parents to come in and paint the place on the weekend!” The longstanding expectations that parents will cook for the school, participate in maintaining the property, and manage the staff are likely to get overthrown eventually as other models of child care become available, but for the moment they persist, and it’s a beautiful thing. Schüli is super flexible; you can pick up your child anytime you like, until 5 or 6 in the evening. The closing times vary by day and I can’t keep the times straight so we always make sure we pick up our child by 5. The kids from the Schüli can access an awesome city playground without crossing the street, so after they have lunch and finish their homework they are free to play in the “laden” or head out to the park. One of the teachers usually accompanies them there, but they can see them from the bench in front of the storefront in any case. They’re not super concerned about who picks up your kid. They don’t ask you to fill out a form listing acceptable people who may pick up your child; they just use common sense. Two weeks ago our neighbors brought E home with them when they picked up their own kids, seeing that our daughter was eager to leave; this note on the door was the teacher’s effort to let me know. 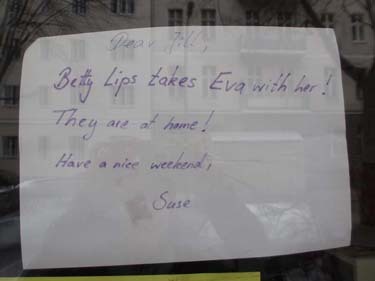 I didn’t find the note until 18 hours after it was posted, walking past the Schüli by chance on Saturday morning. But no harm done; E had made it home by dinnertime the night before. When school is closed, Schüli is open. You don’t have to sign up ahead of time. The teachers are going to be there anyway, so they don’t press you to make you sign up for the extra day, or to pay more for access to care on that day. You just show up. I went in the door and three boys were running through the room with ski masks on their faces and fake guns in their hands. One “shot” the others and the two boys fell to the ground, each whispering “Eins, zwei, drei…” until they reached ten and were allowed get up again and resume the chase. I went into the next room looking for my daughter, and there she was, climbing up a rope strung from the ceiling while other girls dangled over the edge of the loft, shrieking with laughter. From an American perspective there were so many things wrong with this picture, yet it was obvious that the children were content and thriving. Everyone was having a blast. To be fair, the teachers are usually in the middle of the kids, organizing a card game, playing checkers with someone, working with a student on his homework, or listening to a story on a CD on the couch, surrounded by the children. The young woman who took over one of the teaching spots this winter can often be found playing ball with the kids—yes, throwing balls in the house!—even though there are lovely glass windows they can swing open on warm days. The teachers have become friends with one another, and just last night I walked past Schüli at 7 p.m. carrying take-out pizza from a local Italian place and found the two of them lingering on the front bench by the sidewalk, long after the kids had gone home. Our daughter tells us that the male teacher who left his position in the winter occasionally comes back to visit with his infant son and stays for long visits with the kids. Why? Because he likes it there. Actually, I miss seeing him at Schüli. In the fall when I’d come to pick up E, he’d often convince me to sit down and enjoy a milch kaffee and hand me a slice of the leftover homemade cake as well, and we’d have a disjointed conversation in my best German and his best English. Life is good at Schüli, and I’ve never witnessed a fight, injury, or raised voices. It’s a haven for kids to let off some steam after school, run by grownups who are kids at heart, people who love to be surrounded by kids. Every day when it’s time for E to leave, she runs to Suse for their daily farewell ritual, an eye-hand coordination game in which they clap hands together and one person tries to catch the other person’s hand before she pulls it away. Each person has to look into the other’s eyes so there’s no cheating. “Eins, zwei, drei, catch!” Makes me laugh every time to see E try to trick Suse, her eyes latched intently onto her teacher’s as she tries to pull her hand away fast enough not to get slapped. It’s a bright spot at the end of every day for me, and I’m not even the one playing the game. This entry was posted in City life, Parenting and tagged Berlin, Schüli, Schulerladen on March 27, 2014 by Jill M..
Schūli sounds heavenly, except for the mandatory cooking. Well, that is the other side of the supposedly overburocratized Germans. My daughter, who was a child in Germany and a teenager in the US said to me in Minneapolis at age 16: I am so happy that I could be a child in Germany and not in the US. And what she meant was that she hated the constant supervision and regulation of children that she observed in the US. I also often wondered about growing up in the US: Children are strictly supervised until the are about 16 and then all hell breaks loose and it always seemed to me that the adults had given up on the children. They seemed to live in an unconnected world of their own. Is this a false observation?